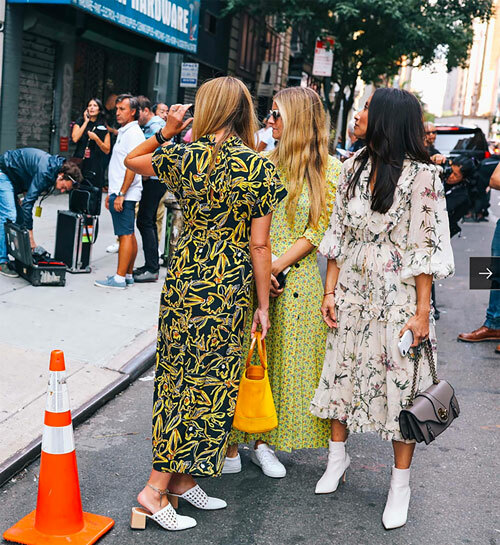 Summer's long dress trend is extending its way deep into fall, with everyone sticking to shin-to-ankle grazers during New York fashion week. I'm a big fan of this silhouette because it's feminine, sandal-to-sneaker-to-stiletto versatile, and throw-on-and-go. I'd like to whirl around in these dresses from Alessandra Rich (above), Topshop, Mango, Warm, Self Portrait (on sale! ), Red Valentino, and Stylekeepers. Do you know who makes the gray handbag with chain on the right? !